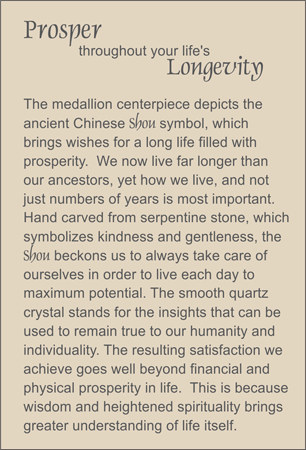 A centerpiece globe of new jade hand carved with the ancient Chinese Shou for long life and prosperity is set into a choker necklace of smooth new jade beads. Trios of smooth rock quartz crystal ellipses surrounding drum-cut amethyst rondelles provide contrast to the soft celadon green color. Sterling silver spring clasp.